Castellina in Chianti, perched on a fragile bed of hills, gladdens the eye with the sweetest of scenery. The town surprises with a number of noble palaces, evolving from the reworking of previous military garrisons, built before by the cohorts of the Guidi counts, who from their homeland of Garfagnana pushed into the heart of Tuscany, seeking to control it through diplomatic means and later by Florentines. The core of the town consists of the centuries-old Rocca, designed in the second half of the 1400s by Giuliano da Sangallo. Walking along via Ferruccio you can still breathe in the ancient feel of Castellina. At the end of this street stands the San Salvatore church, rebuilt in neo-Romanesque style following the destruction during World War II. Castellina in Chianti stretches across a densely wooded area populated by wild fauna, but it is most famous for its remains of Etruscan civilization. From the numerous artefacts unearthed locally it has been ascertained that humans here as early as the seventh century BCE, when this area was one of the connectors between the seaside Etruscan towns of Vulci, Vetulonia and Roselle and the northern towns, as well as towards the Adriatic ports that connected the peninsula to the East. One of the most important relics is the Tumulo di Montecalvario, just outside the town. Consisting of four tombs facing the compass points, the burial ground dates to the sixteenth century and has been deprived of its grave goods due to raiding down the years. Iron and bronze decorations were unearthed here in 1915, once belonging to a war carriage. Farther north, towards San Donato in Poggio, you can still see the old acropolis that still boasts a working well. A small necropolis has been sited near Poggino, which bore grave goods and objects dating to the sixth century BCE. Numerous finds are housed in the Antiquarium, in the sixteenth-century Rocca Comunale di Montecalvario. It would appear that the area, later also occupied by the Romans, was abandoned in the first century BCE, following a ruinous fire. For more news of Castellina we need to wait until 1220, when in an imperial deed issued by Federico II it is learnt that the towns was conceded to some landowners of the powerful Guidi counts. In the same century, Castellina became part of the Lega del Chianti, an organization whereby the town gained strategic importance for its bordering position with Siena. Due to this an important fortification was erected, still partly visible today. The town was at the center of countless clashes. In 1397, it was conquered by the Milanese troops of Alberico da Barbiano. In the mid 1400s, Castellina was attacked by Ferdinand of Aragon, but this time the town managed to resist for 44 days. In 1478, despite the town’s strengthening planned by the famous architect Sangallo, it was besieged once more, this time by the Duke of Calabria. In the sixteenth century, Castellina passed into Medici hands, becoming a lively center for farming, home to farms and noble villas. 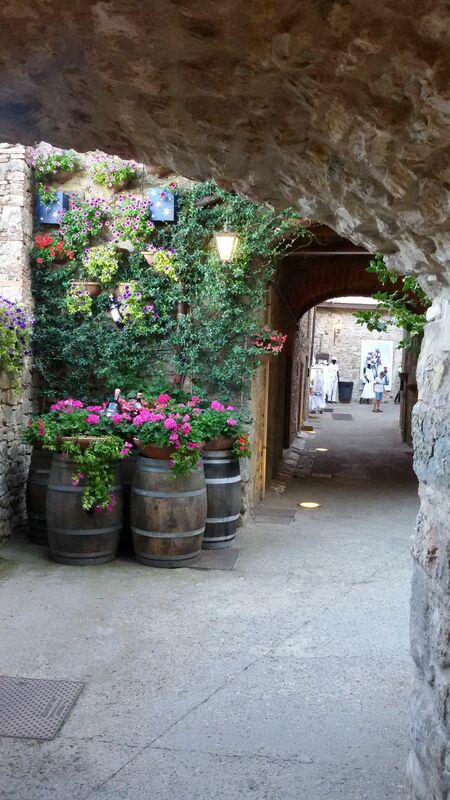 A trip to Castellina isn’t complete with visiting the area’s myriad wineries. Enjoy a wine tasting paired with a platter of local cured meats: Chianti is famous for its pork products vaunting ethereal flavours and aromas.